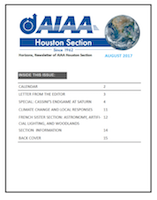 Please join the AIAA Houston Section History Technical Committee for “A Photographic History of Wildlife at and around NASA’s Johnson Space Center” by Gary Seloff, NASA/JSC Information Management Specialist. Wildlife on the campus of NASA/JSC includes bobcats, alligators, coyotes, snakes, lizards, and many kinds of birds, including herons, egrets, woodpeckers, owls, flycatchers, cardinals, mockingbirds, bluejays, sparrows, doves, bald eagles, and ospreys. AIAA Houston Section provides sandwiches (our treat) from Jimmy Johns based on the crowd size using the online registration. The team will discuss their goals for the year, updates to their competition rocket, and improvements to launch infrastructure. Members’ work will be critiqued by panel of subject matter experts who will guide the team in their endeavors. INCOSE TGCC cordially invites AIAA Houston members to join the 12/13, 5:30pm, holiday festivities at Sam’s Boat.